Going to appear in your Degree first-year exam from LNMU Darbhanga this year? Registrations for the examination was completed via online and now, LNMU Part 1 Examination Registration is live. Recently, Degree second year examination form was also live and it's closed now. University has now started the online application for LNMU Part 1 Examination. In this post, I am going to mention each and every point you need related to LNMU Degree first-year examination. Part 1 examinations are also expected from next month in September 2017 and that's why online apply is finally live on the official web portal of LNMU Darbhanga. Each and every activity of Lalit Narayan Mithila University is now available via their online web portal time to time. In the previous year, It was started with Part 1 Online Merit List but now, All the degree 1st, 2nd, and 3rd part admission, results, and everything is expected to be via online mode. Please note that Registration number is strictly required to fill your online application form. Without it, you won't be able to fill it. Also, a clear scanned passport size photo and signature is required. If you have your Part 1 Registration number then you can simply fill your online application form. A scanned recent passport size photo and signature will be needed and that's all. Fill the online application form and pay the examination fee through online mode and after that, you will get the receipt of your part 1 examination form. Here is a list of all the Important Dates, Fee Details, and everything you need in this lnmu part 1 online apply. Update - 27 August, 2017 - Please Note Guys - Examiantion Form Submission of Degree Part 1 of LNMU Darbhnaga will be closed after 27-Aug-2017 and will Re-Open from 01-Sep-2017. As it was mentioned in the latest notification released from University that Online Apply for Part 2 will be extended and it will Re-Open from 28-Sep-2017. So if you have missed it, do it for sure. Update (01 Sep 2017) - Online application for Part 1 examinations are now Re-Open with the late fine. Those who missed filling their application can now submit their form till 5th September. Update (15/09/2017) - Online application for Degree Part 1 Examination is now closed and exams are from 20. Till now there are no updates of exam routine and Admit card. Let's see, what will happen. You will be updated with each and every announcement. Update (18 September, 2017) : So, it's 18th September today and examination was supposed to be strated on 20th. Till now there's no new update of Routine, Admit card or next dates of conducting degree 1st-year examination. It can be expected that examination won't start from the 20th september as there are only 2 days remaining and even routine is not out yet! But it's not confirmed from University and we can't give you guys any update regarding the date or routine. So, Please wait for next update. Update (18 September 2017, 10.31 PM) : So, the wait is over. Here's a good news for those who are going to appear in the part 1 examination of 2017. University has finally released the full centre list and program (routine) as well. Update (19 September 2017, 05.00 PM) : Another big update. The examination program that was published yesterday is partially modified by the university. Examination dates of Hons. subjects are same but there are some changes in the Subsidiary examination subjects made by University in the revised program. It is available to download now. Update (11/12/2017, 05.55 PM) : Big Update Related to Part 1 Practical Exams. University has finally released the dates of LNMU Part 1 Practical and Viva Exams and it will be started from 13-12-2017 in two shiftings. All the colleges will seperately release their practical exam dates according to the number of students. LNMU Part 1 Examination will start from 04 October, 2017 and will end on 17 November, 2017. Below is the full centre list and rourine, download now. LNMU Part 1 Routine is finally published by the University. Instead of 20th September, Examination will start from 04 October and centre list is also published as well. I have already shared the LNMU Part 2 Practical Exam Date and now it's time for the Part 1 Practical Examination Date. Till now we don't have any update of the LNMU Part 1 Practical Date and we will update this section as soon as we get an update. Stay tuned. (Update - 11/12/2017) - University has released a notification in which the Date of Practical and Viva Examinations are mentioned. Examinations will be held from 13-12-2017 in two sittings. Detailed program will ve available according to your college. Examination Routine which was shared by University on 18th september is now partially modified and University has again released the new examination program in which some things are corrected or modified. The routine mentioned in the above table is Revised and current/latest one. This downloadable PDF file contains the complete center list and examination routine. Looking for the admit card of lnmu degree part 1? Its not released yet? Those who are confused that it will come online or offline, I would like to inform you guys that Admit Card will be released online. As soon as LNMU Part 1 Admit Card will be available to download, I will update this post with download links and other details. In part 2 examination, Admit cards were available before 3 days of the examination. So, it can be expected that students will be able to download their LNMU Part 1 Admit Card from 1st october. As soon as Admit Card Downloading goes live on the web portal of LNMU, this section will be updated! 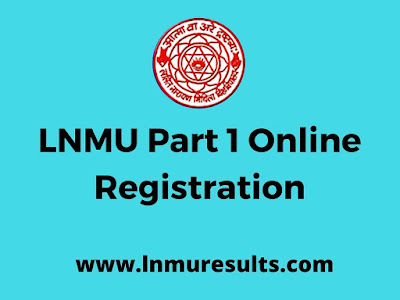 LNMU Part 1 Admit Card is now available to download.You need your University registration number to download your admit card. Good luck for your exams!! Simply follow the below steps to fill your degree part 1 examination form. Kindly keep your required documents handy and scanned documents as well. So, below are the steps you guys will have to follow. A pop up window will appear with some instruction. First of all, Read them carefully ! Now, Enter your Registration Number in given field and click on Search button available there. If the number will be correct, a new window will appear. On that page, fill your details. Now, Click on Save and It will be saved. On the next page, you will see your filled details. Check all the deyails, mobile number, email id, photo, signature and everything twice and proceed to payment. Now make your payment and you will be redirected to an new page where Print Application option will be available. Click on it and the pdf will be downloaded. Now open it and print it. That's all. If you are an Ex-Regular student, steps may be different from the above mentioned. Kindly read the instructions and follow them accordingly. So, that's all under the topic LNMU Part 1 Examination Online 2017. If you have any queries related to it, Let me know via comments and I will reply back as soon as possible.